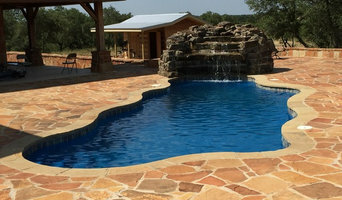 We are Texas largest installer of in-ground fiberglass swimming pools. We offer Viking Pools, Trilogy Pools, and Liberty Composite Pools. We too are a proud member of the Better Business Bureau, the National Pool and Spa Institute, the Association of Pool and Spa Professionals, the National Association of Home Builders, Best of Class Pool & Spa, the Master Pool Builder's Guild, as well as Insignia Pool & Spa Builder and a member of the Composite Pool Corporation Advisory Board. Our speciality is fiberglass swimming pools, we have over 20 years of experience and successfully built over 2,000 fiberglass pools. Since 1985, Keith Zars Pools has designed and built magnificent custom swimming pools in San Antonio that integrate seamlessly with their natural surroundings. Our breathtaking pool designs and extraordinary craftsmanship blur the lines between indoor and outdoor living and create an oasis of tranquility. 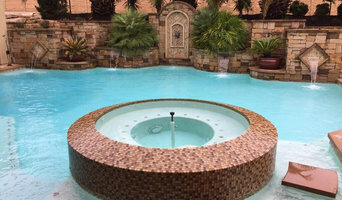 Keith Zars Pools is the number one San Antonio custom swimming pool designer and builder. We are proud to offer our customers Pebble Tec Superior Quality Pool Finishes, and each of our pools is custom designed and constructed to fit the individual customer's needs. We stake our reputation on fine design, quality craftsmanship and our personal commitment to give YOU, the customer, our absolute best. Our customers' complete satisfaction is our number one priority. We work with you every step of the way to create a unique outdoor environment that is a reflection of your lifestyle. What's more, Keith Zars Pools stands behind every pool we build to ensure total customer satisfaction. Make A Splash Pools & Spas is family-owned, locally operated, and is the most customer-focused builder of high-end residential and commercial swimming pools in Central Texas. We custom-design pools, patios, landscapes, outdoor kitchens, water features and more. Unlike some large competitors who are known for treating customers like work-order numbers, we prioritize your satisfaction over our margins. We really want your business, but not without developing a relationship, because we know you are going to want someone you can count on. To us, the customer is the top priority, the key to our success, and the reason our service exists. Make A Splash Pools and Spas has 20 years construction experience, and is a Lean Six Sigma business. Innovation Pool Structure, LLC is a local and family owned business established in 2016 by Javier Martinez and his son, Francisco in Del Valle, Texas to service Central Texas and its surrounding areas. We provide services to the city of Austin, Pflugerville, Round Rock, Georgetown, Del Valle, Buda, Taylor, Cedar Park, Leader and West Lake. If your property is in Central Texas, and you don’t see your city, please give us a call and we can confirm services for you. Mr. Martinez brings to his projects over 25 years of experience building commercial and residential pools, providing maintenance, repair and restoration and his son, Francisco Martinez brings 15+ years of experience to the company in the same industry. Our philosophy is to provide our customers with a combination of hard work, quality service and reasonable prices. We understand we work in a competitive market, but we bring to our projects a lot of experience and compromise. A swimming pool addition to your house or business is a big investment, and selecting a company to take care of this commitment shouldn’t be taken lightly, when you work with Innovation Pool Structure, LLC you know you will receive one-on-one treatment and our prices are not corporate prices, it is our family working for your family to create a masterpiece pool for you. We are reliable and professional and you will definitively be making the right decision. We are licensed and insured. Our family working for your family! Since the Summer of 1952, the California Pools family has been making backyard dreams come true for families like yours. Since our humble beginnings 60 years ago, we have become the World’s Most Awarded Pool Builder for our design excellence. However, design is only part of the California Pools Experience. We also have been recognized as one of the Top Companies in the nation for our Customer Service. Having grown up in the swimming pool industry, local Texas resident and Owner/Manager Justin McGuire joined the California Pools vision in 2000. His experience and personal service have led to numerous awards including Manager of the Year and Pool of the Year. However, his favorite reward is a thoughtful note from a satisfied client. California Pools is proud to serve the Austin, TX community, helping people like you create a custom backyard living experience that matches your home. Our Austin Texas California Pools team can design and build custom outdoor kitchen and shade bar so you can enjoy our beautiful Texas outdoors all year long. Whatever your backyard dream is, we can make it a reality. After working for a local dealer for the past few years I fell in love with hot tubs and hot tub clientele. I started completing work as The Hot Tub Man on my days off and saw an opportunity to bring a new level of customer service to the repair and maintenance of spas and hot tubs. Business has grown quickly and now we are scheduling The Hot Tub Man full time! I am proud to be a Marine Corps Veteran and family business owner. We are building our business through positive word of mouth and providing a whole new customer experience that puts the ahhh back in your spa. Aquamarine Pools of San Antonio is San Antonio and south Texas leading installer of composite fiberglass swimming pools. We have over 100 high quality fiberglass pool and spa designs, which are backed with an industry best lifetime warranty on the fiberglass pool and finish. AquaPools is Texas #1 installer of fiberglass swimming pools and we look forward servicing our customers wants and needs. Remember Aquamarine Pools for fiberglass pools in San Antonio, TX and surrounding areas! Jim Blow has been building high-quality luxury pools, spas, patios, and outdoor living spaces in the Austin area for the past 30 years and he is personally involved in each project from start to finish. Jim uses his experience and expertise to build the pool you envision for your lifestyle—both functionally and aesthetically. 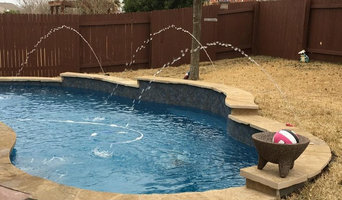 Water Rock Custom Pools & Outdoor living is a San Antonio based Outdoor Living contractor specializing in custom outdoor designs and installations. We offer custom pools, water features, fire features, grottos, custom patios & decks, outdoor kitchens & bars, fireplaces, fire pits, seating walls & stone and stucco fence walls, patio covers, awnings, pergolas and "ultra customized installs including floating patios and fire/water feature combos. We have been working in San Antonio for almost 20 years and have been known as Texas Wholesale Custom Pools & Outdoor Living. After many years of specializing in strictly outdoor living projects, we are changing our name to better reflect our customers what we provide. Thank you for taking a look at our page and feel free to contact us with any questions about a renovation you may be considering. Founded and headquartered in Austin, Tx -Tailored Pools has established a reputation as a premiere custom pool builder throughout Austin and Central Texas. Our goal is to provide our customers with the highest quality swimming pool at the best value and backed by the most professional customer service in the industry. Together we'll design a pool that fits your landscape, your lifestyle, and your budget. *Belgard Authorized Contractor* Our team of professionals have years of experience and we understand the decision to include a pool into your livingspace is one of the most important buying decisions you will make. A swimming pool can transform your backyard and increase the value of your home. The bottom line – choosing the right swimming pool builder is essential! We are a proven swimming pool builder servicing the San Antonio and surrounding areas. We specialize in fiberglass pool installation and service. We are dedicated to helping you make the right decision when it comes to the pool construction process. We are a reliable pool builder you can trust to not only deliver a quality product, but one that will also withstand the test of time. Our pool builders combine quality construction, innovative design, excellent craftsmanship and superior support on every project, every time. Let us help you make pool ownership easy and enjoyable. Contact us today to learn more. Hydra Sun Pools provides swimming pool service in San Antonio and surrounding communities! Whether you need us to focus on design, construction, and maintenance, or on simpler matters like routine cleaning of residential and commercial pools, we offer a variety of services to suit your needs.